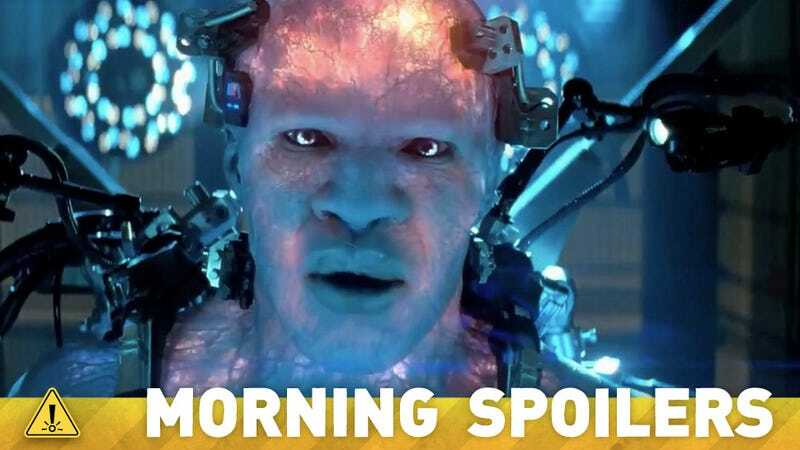 Did Marc Webb just confirm another Amazing Spider-Man 2 villain? Phillip Seymour Hoffman won't be recast for the Hunger Games movies. Danai Gurira outlines the dilemma Michonne will face when The Walking Dead returns. And some important Doctor Who shoe news! Plus, get a look at new photos from Captain America: The Winter Soldier. Spoilers now! A tweet from Marc Webb seems to have revealed that B.J. Novak (The Office) will be playing Alistair Smythe, aka Ultimate Spider-Slayer, in Amazing Spider-Man 2. Webb tweeted a link to Novak's book promo and identified him as "A. Smythe." The Daily Bugle tumblr has hinted at the Smythes and their Spider-Slayers in a post identifying Alastair's father Spencer Smythe as the head of Oscorp's R&D. Travis Chase, a man putting his life back together after fifteen years in prison, takes a solo hike into the Alaskan Rockies. He's just looking for a quiet place to think about his future, but what he finds is trouble: a 747, downed in remote wilderness, the wreck impossibly undiscovered by authorities. Those aboard are dead, though not because of the crash. They've been shot. This aircraft, along with the terrifying object it was transporting, is only the beginning for Travis. Within hours he finds himself at the center of a violent conflict that spans the globe, and a secret war that dates back three decades. A war for possession of radically advanced technology—that wasn't created by human hands. I think Andy said it best. There's space around events in a way that is definitely different. There is a lot of honing in on people and their experiences and their inner turmoil and outward trauma. There's a lot more getting to know everybody. We're not functioning in an ensemble-like way anymore because the group is fractured. What I love about that is that looking at it from a macro-perspective it is fantastic storytelling-wise because in the little research that I've done I learned that one of the key elements of war is displacement. People are caught up in the concern of where people are and what happened to them and not having any way of finding out. That's such a rich, authentic component of what really happens in a war zone. So I think that's really thrilling that's going to be rippling through the back eight. Then the trauma hit and I think the big question is, will this clam her back up or open her up? It's a question of going back to the old her or going on a different path. That's the question sitting on her soul as she tries to metabolize the trauma that's befallen her. Peter Capaldi&apos;s brand-new Doctor Who outfit revealed! The new boots worn by the Doctor are not Dr. Martens as our expert costume department believed they were but he may wear them in the future. Peter Capaldi came in a week or two before Christmas and said he was looking for a pair of smart dress boots. I suggested this one, because not only is it very smart, it's exclusive to us and made in England. It's a great boot. He bought it in size 10. One hint is that there may be a spark between him and Ethan. Obviously he did his best effort to help him throw that party. So I would say that might win him a few points. There's definitely more to Danny I think we still haven't gotten into. He's been in more episodes as of each season, but I feel there's some depth to him and things we could uncover. His last name also, Mahealani, which means night of the full or night of the heavenly moon, is something that has also yet to be explained. So who knows? I honestly don't know.